Most every aspect of a fish's life is influenced by water temperature, which in turn is affected by wind, seasons, currents, and evaporation. READ ANY fishing article about a given species, and you will almost always find some commentary about the best water temperature to find or catch the fish. Anglers, especially fly fishermen — as well as marine biologists and oceanographers — generally concur that water temperature is one of the most important components in determining where fish will be and how they behave. Most fish are cold-blooded, which means they do not control their internal body warmth and thus are strongly influenced by the surrounding environment. This explains why a fish’s skin will usually feel cool when you touch them: Their temperature will be similar to the water’s; whereas ours is close to 99 degrees F.
A few species, such as bluefin tuna, are somewhat warm-blooded in that they can control the temperature of some important organs, most notably their brain. They do this by using muscle movement to generate heat. This warm-blooded aspect allows bluefin tuna to range widely over the ocean since they will be little affected by the fluctuating water temperatures. Cold-blooded fish, however, do not have this luxury, and they must stay within a narrower temperature range. Their ability to navigate within this invisible field, and to sometimes acclimate along its harsher edges, influences everything from how and when fish feed, to where they stay, when they migrate, and when and where they spawn (see figure). Temperature changes occur both horizontally and vertically with depth, making the comfort zone a constantly moving target. Fortunately for cold-blooded fish, water has a high heat capacity. In simplest terms, this means that the water temperature changes slowly. Because of this, most fish are rarely trapped by a major shift, since any change will be slow enough to allow them to escape. This is important because most fish are very susceptible to abnormally rapid changes in water temperature. Because cold-blooded fish live within a small temperature range, they can do little more than leave an area once the water reaches their high or low tolerance limit. Many fish try to stay within what is called their thermal optimum — not too warm, not too cold — just right. This thermal optimum varies for different species. The temperature range for striped bass is thought to be between 50 and 75 degrees, with their thermal optimum from 55 to 65 degrees. For stripers, or any other fish, these numbers are not rigid barriers. In fact, if necessary, most fish can spend some time outside of their temperature range. The process of a fish finding its thermal optimum by moving to cooler or warmer water is called thermoregulation. This determines where fish will be during different seasons. The attempt by fish to stay within their thermal optimum will in effect determine the occurrence of particular species in an area as the water cools or warms. Water temperature is certainly a key factor for fly fishers who chase striped bass and other game fish along the Atlantic seaboard. In spring, as the ocean starts to warm, the first arrivals from the south will be striped bass and bluefish, followed later by bonito and little tunny (false albacore). This pattern reverses itself as the water starts to cool in the fall, when the albies and bonito generally head south first. Looking in more detail at the stripers, their spring migration may be more closely tied to the northward migration of prey, such as herring, which in turn are probably influenced by warming water and spawning urges. Once the bass arrive, the larger ones will often be the first to move into the estuaries to feed on spawning bait, as they can apparently tolerate cold water better than smaller fish. As the water continues to warm, especially on the flats, smaller fish will show. When the ocean gets even warmer, the bass will move offshore into deeper and colder water, still seeking their thermal optimum. Their feeding will also more likely be at night, when it is cooler, rather than in the heat of the day. The observation that bigger fish can tolerate colder water than smaller fish of the same species is common. This trait has not been really studied, but there are many anecdotal examples. For instance, larger stripers are usually found deeper and below smaller stripers, and deeper water is usually cooler. However, there may be other environmental or biological factors operating to create this behavior. The bigger fish may simply be increasing their feeding efficiency by eating the sinking prey disabled by younger fish feeding above them. To my knowledge, there has been limited scientific research on temperature preferences for most game fish. In fact, most information comes from fishermen, who are mainly interested in finding feeding fish, which will usually be hunting prey within their core comfort zone rather than along its the outer limits. But suffice to say that temperature preferences are often not rigid numbers. And when necessary, fish can often survive in water somewhat above or below that range, although there probably is a time limit as to how long. Many species of fish hunt, feed, or congregate where there is a change in water temperature. There have been experiments that have shown fish’s ability to detect small (less than a degree) changes in water temperature, as well as detect if the water is warming or cooling. How they do it, however, is not completely known. Certainly their skin is involved, and in some species the lateral line may help detect temperature changes. Most fish have an increase in the rate of their metabolic processes as the water warms and a decrease as the water cools. A general rule is that with each 18-degree rise in water temperature, metabolic rates will double. This includes the processes of growth, swimming, feeding, and digestion. And in general, cold water slows down most fish, whereas warm water can activate them, but only to a certain point. If they can return to cooler water they often will be re-energized. But if the temperature gets too high, fish can become lethargic and even die. Increasing water temperature also makes breathing more difficult for fish. The warmer the water the less oxygen it can hold. 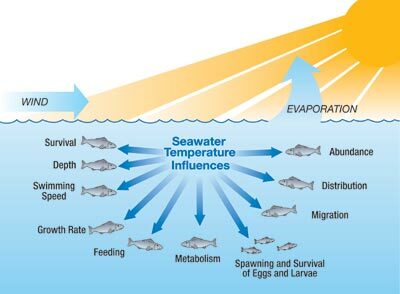 The problem is compounded for many fish since their metabolic activity will increase with a rising water temperature. Thus they will need more oxygen from an environment that now has less. If there is not enough oxygen and the fish cannot get to a cooler place, death is inevitable. If there are a lot of fish, perhaps traveling as a school, they will rapidly consume the limited oxygen, possibly leading to a large fish kill. Because of this problem, most fish do better in colder-than-usual environments than in warmer-than-usual conditions. Clearly, then, fish are vitally in touch with the surrounding temperature. The more an angler can learn about his quarry’s preferences, the more success he will ultimately enjoy.